Ken Danby’s realistic images – especially those related to hockey – and his portraits of Canadian sports stars have become popular over the years. 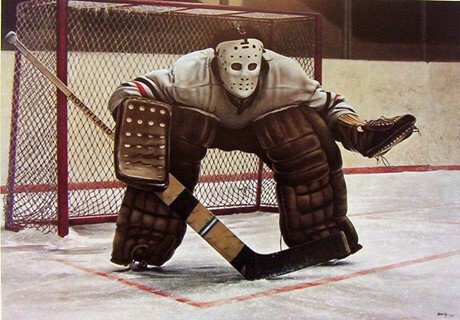 Some, like At the Crease (1972), which shows a goalie guarding his net, have become part of our cultural fabric. Danby displayed an interest in art from an early age, and enrolled in the Ontario College of Art in 1958. His first one-man show was held at the Walter Moos Gallery in 1964. Thereafter, his work gained attention and he was sought after for commissions, particularly for sport portraits. After designing the Canadian Olympic coins for the 1976 Montreal Olympics, Danby completed a watercolour study on Olympic athletes from different disciplines. In 1981, he was commissioned by the National Hockey League to create a portrait of Gordie Howe. Danby later completed works on other hockey greats, including Bobby Orr (1993) and Wayne Gretzky (2001). See Danby’s works and learn more about the artist on his official website. Watch the CBC Television Ideacity 2005 segment called Ken Danby on the Importance of the Arts. Read about – and decide for yourself – who is the goalie represented in Danby’s At the Crease from an article featured by Canada.com.